Koshie Mills’ three sons have distinct personalities, and they all correspond with the personas of well-known and accomplished actors. The eldest is the life of the party, a charismatic cross between comedians-turned-actors Eddie Murphy and Jamie Foxx (“The party starts when he arrives,” she jokes). The middle son is more like Denzel Washington: “He is more introspective and philosophical​; he’s my charmer; everyone flocks to him,” she explains. The baby is a Denzel/Will Smith mix in the group. Dubbed “the diplomat,” he’s​ “the spiritual conscience of the brothers and always pushing others to view life from different perspectives,” Mills said. And this supermom knows her sons very well. Like most any proud mother, Mills can’t contain her excitement when she speaks of her “boys” — well, fawning and gushing is more like it. And she’s got plenty of reason to do so. Her middle son, Kofi Siriboe, 23, is best known for his breakout role as Ralph Angel Bordelon on Ava DuVernay’s drama series Queen Sugar on the Oprah Winfrey Network (OWN). The swarthy heartthrob began acting at age 6 with print work and television commercials, followed by ​guest ​roles on CSI: Crime Scene Investigation and a ​recurring role on MTV’s ​comedy series Awkward. He made his film debut in 2008 in the comedy-drama The Longshots. The eldest, Kwame Boateng, 25, got an early start too, acting and modeling at age 8 and appearing in more than 30 national commercials and movies, including Not Easily Broken, a film based on a T.D. Jakes book. He also snagged roles on television shows The Chicago Code, The Office, ER and Everybody Hates Chris. 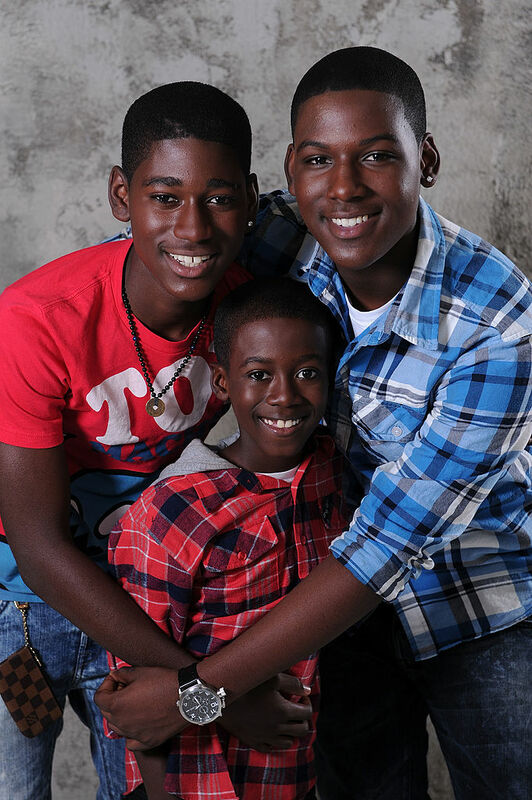 At 18, Kwesi Boakye is the youngest of the brood. (“He booked his first job at 9 months,” gushed Mills.) He played Manny in the 2009 Tyler Perry film I Can Do Bad All By Myself and has also previously done voice work for The Looney Tunes Show and The Amazing World of Gumball. He has also ​starred in television shows such as TNT’s Murder In The First with Taye Diggs, ABC’s Mind Games, Touch, The Mentalist and Hawaii Five-O and as a series regular on Ray Romano’s Men of a Certain Age. Being “mom” to three of Hollywood’s brightest rising stars is no small feat. Add in a flourishing, nearly 26-year marriage and helming her own full-service, boutique multimedia firm based in Beverly Hills, California, and it’s safe to say that this “mom-ager” is, like Jill Scott sings of, living life like it’s golden. From left to right: Actors/brothers Kwame Boateng, Kwesi Boakye and Kofi Siriboe pose after the making of a TV commercial for Code Blue PSA Campaign, designed by actor Jermaine Crawford on Oct. 17, 2009, in Los Angeles. Crawford created Code Blue to bring awareness of and to fight against the issues that threaten teen youth. After many years solo, Mills now shares management duties and also serves as publicist and does branding for all three. Having dear old mom so inextricably intertwined in their lives both personally and professionally is not a problem, they insist, but a plus. Boateng said he feels similarly. Mills laughs at the assertion that all three of her uber-talented sons hold their own as bona fide “bae” status (some of their adoring fans have even nicknamed them “Triple Chocolate Crunch”). While flattered, she said, she’s most proud that they’ve developed into positive, respectful and upstanding young men who are equally proud of both their American and African roots and give back to the community. When she thinks back to the 10 years she spent solo managing their careers in film, television, voice-over and modeling work, she can’t help but feel a personal sense of accomplishment. Somehow she juggled it all around their schooling, extracurricular activities and, through much of it, a full-time job working overnight as a registered nurse. Oprah Winfrey Network’s Queen Sugar premiere at the Warner Bros. Studio Lot Steven J. Ross Theater on Aug. 29, 2016, in Burbank, California. Her husband, Kwame Boakye, cared for them while she worked and made sure they got to school each morning, giving her just enough time to rush home to grab two hours of sleep after work before calls from casting agents started pouring in around 10 a.m. There were always last-minute auditions or jobs across town that clashed with school schedules. Even with their natural, God-given abilities, Mills said, cultivating the talent within her brood took time and sacrifice. For example, on countless evenings after a long day on set, she’d meet her husband, style aficionado and fashion consultant, in arbitrary parking lots to hand the boys off to him, car seats and all, just in time to race to work at the hospital. And then there were the afternoons she’d meet up with teachers at McDonald’s to scoop up a child (or children) stuck at school late when another’s acting job ran long. She finally ended her 19-year nursing career in 2011 to devote herself full time to her sons’ careers. Her passion for her family runs as deeply as her West African roots, which she and her husband have always shared with their children through music, language and their favorite: food. Mills is far from meek when speaking of her cooking skills. During the holidays, one of the rare times the entire family is all together under one roof, her sons always flock home to Los Angeles, ready for one of her world-famous feasts. Mills said she remains committed to serving as a “connector to bridge the creative gap between Africa and America,” and she hopes to one day soon spearhead an initiative that helps to “rebrand the dastardly images [often] perpetuated in the media about our black boys.” Well, it seems her three sons have already gotten a jump on that idea. Mills said she’s not sure what her sons and husband are planning to pull off for her this Mother’s Day weekend, but she expects it to be epic. The K brothers don’t disappoint.